Since he started out as an actor, 20 years ago, Tiago Rodrigues has always looked at theater as a human assembly: a place where people meet, like in a cafe, to confront their thoughts and share their time. His encounter with tg STAN, in 1997, when he was still a student, definitely confirmed his attachment to the absence of hierarchy in a creative group. The freedom he found when he first started working with this Belgian collective would forever influence his future works. In 2003, he co-founded with Magda Bizarro the company Mundo Perfeito, with which he created and presented about 30 performances in more than 20 countries, becoming a regular presence in events such as Festival d’Automne à Paris, METEOR Festival in Norway, Theaterformen in Germany, Festival TransAmériques in Canada, kunstenfestivalsdesarts in Belgium, among others. He collaborated with a large number of Portuguese and international theatre artists, as well as choreographers and dancers. He also taught theater in several schools, namely the Belgian dance school PARTS, directed by choreographer Anne Teresa De Keersmaeker, the Swiss performing arts school Manufacture and the international project École des Maîtres. Parallel to his theatre work, he wrote screenplays for film and television, articles for newspapers, poetry and essays. His latest performances granted him international recognition and a number of national and international awards. Some of his most notable works are By Heart, Antony and Cleopatra, Bovary, The way she dies and his latest piece, Sopro, created at the Festival d’Avignon. Either mixing true stories and fiction, rewriting classics or adapting novels, the theatre of Tiago Rodrigues is deeply rooted in the idea of writing for and with the actors, searching a poetical transformation of reality through theatrical tools. That desire is obvious in projects such as Occupation Bastille, an artistic occupation of Théâtre de la Bastille, in Paris, by almost a hundred artists and spectators in 2016. In 2018 he was awarded with the XV Europe Prize Theatrical Realities. 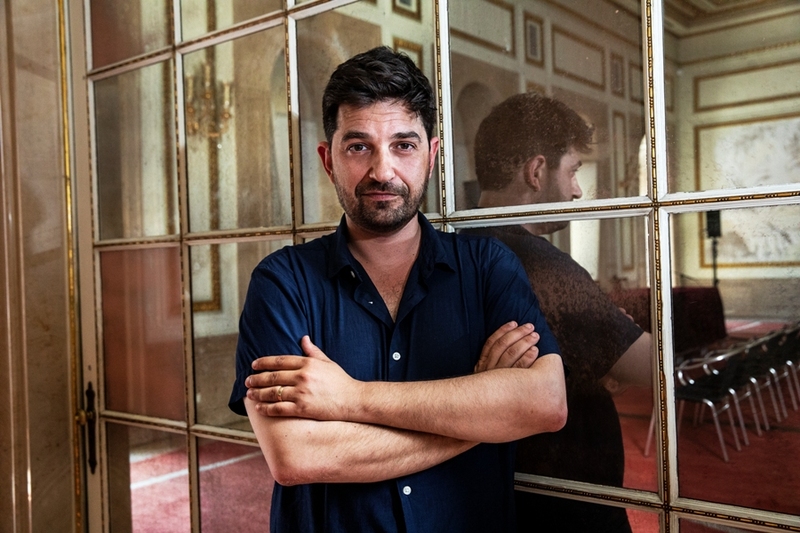 Director of the Teatro Nacional D. Maria II in Lisbon since 2015, Tiago Rodrigues has become a builder of bridges between cities and countries, at once host and advocate of a living theatre. If we say one of the names, the other follows it. Our memory cannot evoke one without the other. Plutarch wrote that, from them on, love became the ability to see the world through the sensibility of someone else’s soul. They mixed love and politics and came up with a politics of love. They are a historical love story. They are a romance based on real events often romanticized about. Shakespeare built them a verbal monument that turned into the truest of truths what never happened to them. In Mankiewicz’s film that led 20th Century Fox to bankruptcy, Richard Burton and Elizabeth Taylor were the celluloid and real couple they never – and always – were. In this show written and directed by Tiago Rodrigues, Sofia Dias and Vítor Roriz are the here- and-now duo of what they were there-and-then. They are and are not Antony and Cleopatra. They are Antony seeing the world through Cleopatra’s eyes. And vice-versa. Always vice-versa. Vice-versa as a rule of love. Vice-versa as a rule of theatre. This show is seeing the world vicariously, through the sensibility of the souls of Antony and Cleopatra.